The Simply Complex Blog: Ever wanted to use the Revit "Repeater" Command on a Loadable family other than an Adaptive Component? Ever wanted to use the Revit "Repeater" Command on a Loadable family other than an Adaptive Component? Currently in Revit you are only allowed "repeat" an adaptive component family. What if you want to repeat a planting family or some other family other than an AC along a path? It is possible with DynamoBIM! Click run and DynamoBIM will repeat your planting family. In Revit along you ....could nest the planting (or other non AC) family into an AC family and then use the repeater command. 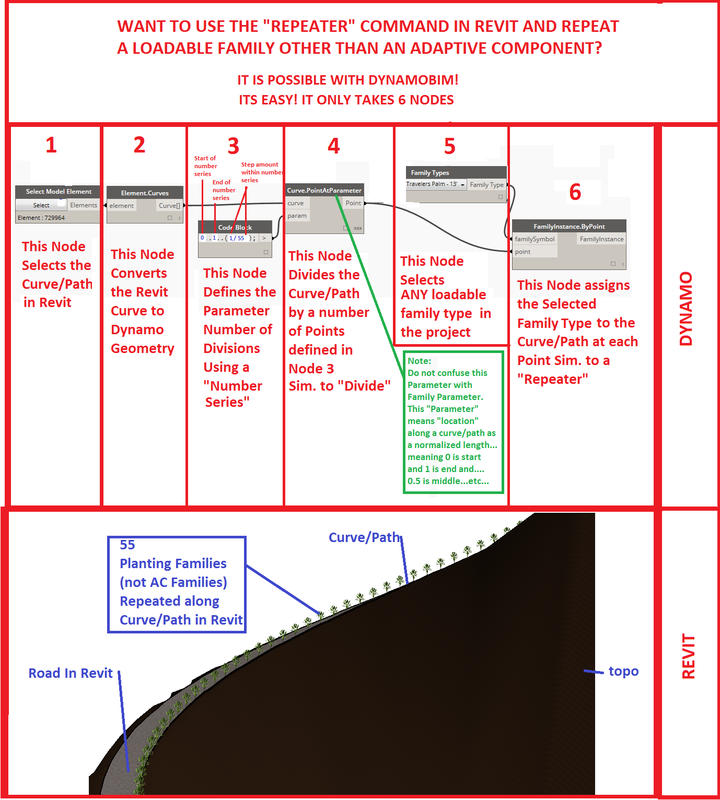 But the method above (that used DynamoBIM)eliminates the need to nest families into eachother and, as shown in the previous post, the number of repeated families is not limited to 200! So think about using DynamoBIM on your next repeater task and have fun repeating those Loadable families! Very cool! I'm so going to use this. Thanks for the great examples as always marcello! Nice post! Is possible insert the components with a rotate position, for example, perpendicular to the path? And the distance between componets isn't the same if you made a path with several points, is possible fix a distance between components like a 1 meter?